Today I was over at Good Day DC on Fox5DC sharing some style tips on how to curate your ideal wardrobe in 2019. After all, it is January-the perfect time to think about deluttering and organizing your wardrobe for the New Year. I stopped by Let's Talk Live to play a game of "Slay or Nay" for the Emmy's red carpet fashion. Check out the segment for all the fashion hits and misses and all the hot trends. Early in February, I was over at Good Day DC at Fox 5 sharing some fun Athleisure looks. This morning I was over at Fox5DC sharing some fun fall trends with UK's top retailer Boohoo.com. This month boohoo.com is hitting the East coast streets with an interative branded trailer. Yesterday I stopped by Let's Talk Live to chat with Melanie about the launch of my new curated shopping site Capsule. We also talked about the basics of a capsule wardrobe, why it works, and how to create one. Hi everyone! Hope you're having a wonderful weekend. I was supposed to be in Miami the past few days for a much needed girls weekend with some of dear friends from Boston. But unfortunately the snow storm we had here on Thursday put a huge damper in my plans and after several cancelled flights I was unable to make it. So this weekend we are just relaxing and catching up with errands and I decided to dabble a bit with video. There are certain items women should invest in such as a classic timepiece, great trench coat, a fabulous pair of neutral pumps, and an everyday tote. Most women carry the same bag everyday to work so why not make it fabulous right? Today I was over at WJLA/ABC's Let's Talk Live DC sharing all the red carpet fashion hits and misses from last night's Golden Globes Awards. On Air: Holiday Fashion with FOX 5 D.C. Yesterday I stopped by Fox5DC/GoodDayDC to share some outfit ideas and style tips for Thanksgiving and the upcoming holiday season. I was over at Let's Talk Live on Newschannel 8 as part of the Let's Talk Live "fashion police" where we dished on all the fashion from at the red carpet at the 68th PrimeTime Emmy Awards. Most women typically use large totes and satchels during the day and reserve their beautiful small clutches for the evening. But there so many times when we need one bag to function for day and night events right? So on yesterday's TV segment over at Fox 45 Baltimore I shared some of my favorite bags that can easily transition from day to night. I stopped by Let's Talk Live over at ABC7/NewsChannel 8 for a fashion segment highlighting the best and worst fashion from the 2017 Golden Globe Awards. I stopped by Great Day Washington on WUSA9 to chat with host Markette Sheppard about some of the hottest accessory trends for the upcoming fall/winter season. Check out the video below and shop the items featured on the TV segment. In case you missed it this week I launched my new curated shopping site called Capsule. Here is a short video describing what a capsule wardrobe is, why I created Capsule, and how the shopping site works. During Thanksgiving many of us are spending time with family and friends and the day usually consists of lots of eating and drinking. So when it comes to your wardrobe it's best to choose outfits that are stylish but not too tight and constricting. The perfect outfit would be both cozy and chic. Yesterday I stopped by Let's Talk Live to chat with Melanie about Spring's hottest fashion and accessory trends. Thanks to Bloomingdales Chevy Chase for providing the items. This morning I stopped by Fox 5 DC to review fall fashion trends with Annie Yu of Fox 5 DC and Alicia Russman of Undeniable Boutique. We didn't get a chance to cover all of my top trends on the segment so I wanted to share them here with you. Check out the segment above and some of my favorite fall trends below. Today I had the pleasure of hanging out with the morning crew at Fox 5 DC to chat about the hits and misses from last night's Emmy Awards. Below are some of my favorite and not so favorite looks. Most of us spend time creating beautiful outfits but often we forget about the foundational pieces that that help make the outfit look it's best. Undergarments such as bras, underwear, shapewear, and camisoles are essentials and all women should have these items in their wardrobe. Now that the Fourth of July has passed it is apparent how fast the summer is going and it’s time to really get outside and enjoy the next month and a half. As exciting as it is to take some time off and be in the sun, everyone wants to look his or her best and find that flattering and fun suit. From ruffles and tribal prints to black and white one pieces we have picked out the hottest trends for any body type. Summer is the prime time for wedding season and sometimes it it hard to figure out what to wear for the many different types of weddings you may find yourself invited to. From country club ceremonies to backyard nuptials it can all be a bit overwhelming to figure out what is appropriate to wear. Earlier today I was over at Let's Talk Live sharing some fun outfit ideas for summer weddings. In a recent NBC 4 interview with Barbara Harrison I had the wonderful opportunity to discuss the topic of redefining success and implementation of a "third metric" with editor-in-chief of The Huffington Post and author of the new book, Thrive Arianna Huffington. Summer is just around the corner and when it comes to summer style at the office it is all about relaxing your style but not going too casual or showing too much skin. Yesterday I was over at Let's Talk Live and shared a few key style tips on how to dress for work in the summer heat. 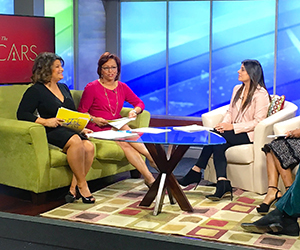 Today I stopped by Fox 5 DC for a fun Style File segment with anchors Annie Yu, Allison Seymour, Sarah Simmons, and Steve Chenevey. We had a great time talking about sunglasses trends for the Spring and how to find the perfect pair of sunglasses for your face shape. 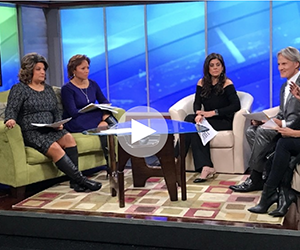 Yesterday I stopped by Let's Talk Live on NewsChannel 8 for a fun style panel with Melanie Hastings, Andrew Roby, and Carine Krawieck. We talked about fashion from the Grammy Awards and shared our best and worst looks. This morning I stopped by Fox 5 Morning news to talk with Annie Yu and Allison Seymour about some of the best and worst looks from last night's Grammy Awards. This morning I stopped by Fox 5 Morning news to talk with Annie Yu and Allison Seymour about some of the best and worst looks from last night's Golden Globes. A couple of weeks ago I stopped by Let's Talk Live DC to share some of the season's best fall holiday looks. Going to your in laws or boyfriends family place for the holidays can be nerve-wracking. Even if you know them well , spending Christmas at your other half's house presents a host of etiquette issues. Finding an appropriate outfit for the occasion is an important way to make a good impression. A few weeks ago I stopped by Let's Talk Live to chat with Natasha Barrett about stylish Thanksgiving holiday looks. I styled three outfits including what to wear for holiday travel, Thanksgiving dinner with family and friends, and Black Friday shopping. Many of my clients have been asking me how to style their scarves so I thought it would be fun to share a video of some easy and stylish ways to wear a scarf for fall and winter. In the most recent video for my You Tube Series "The Modern Mompreneur" stylist Naina Singla of STYLE'N provides tips on looking chic in everyday mom attire. Looking to add some fun fall pieces to your wardrobe for fall? I've got you covered with some of hottest trends and must have items for fall. With longer check in's, stricter baggage restrictions, and long waits at the baggage carousel it is a much easier to travel without checking in bags. Today on Let's Talk Live DC I am sharing a few style tips for traveling with a just a carry on bag. Whether you are traveling for two days or two weeks these tips will help you travel light while still looking stylish. On my latest fashion segment over at Let's Talk Live Melanie and I are talking about what to wear to summer weddings. From a relaxed beach setting to a city chic wedding I have lots of great style tips and outfit ideas for you. On the latest fashion segment at ABC7's Let's Talk Live Melanie and I are talking about this season's hottest swimsuit trends for every body type. From vintage inspired bikini's to asymmetrical one piece swimsuits there are tons of amazing styles to choose from. Last week I stopped by ABC's Let's Talk Live to chat with Melanie about all the fun trends for the spring season. From lucite bracelets to black and white chic handbags and block heel sandals there are tons of great and affordable options out there for everyone. From bold beautiful stripes to the vibrant rainbow hue of colors there are so many fun trends for the upcoming spring season. On Friday I stopped by Let's Talk Live DC to chat with Melanie about how to refresh and update your work wardrobe for the New Year. A work wardrobe doesn't have to be all business-like so check out these six easy ways to add some flair and style to your workday! Today on Let's Talk Live DC, Melanie, Natasha, and I are discussing how to take your favorite summer pieces and wear them through the cooler months. So take out your floral dresses, mini skirts, and tank tops from the back of your closet because I am going to show you how you can rock them right through the fall and winter. Check out my latest fashion segment with Melanie Hastings on Let's Talk Live. We are chatting about fun and wearable accessory trends for the upcoming fall/winter season. From cozy knit sweaters to chic leather and winter whites, there are so many great trends this season. Check out my latest fashion segment with Melanie Hastings on Let's Talk Live. We are chatting about wearable and affordable trends for the fall season. Every season has trends and looks that come and go and accessories are a great way to tap into these trends without spending too much money and committing to passing fads. Check out my fashion segment with Melanie Hastings at Let's Talk Live. We are talking about how to update your look with accessories. Quoted in The Hill "Inauguration fashion: what to wear and how to wear it"
The Daily Express: Melania Trump more conservative when Donald gained power-has she missed vital trick? Entrepreneur : The Professional Dilemma-Passion or Pay?